Freeriding in the Kobi gorge., N (north), 5,4 km., ⎋ 02:40 h., ⇡ 00:15 h., ↑ 0-70 m., ↓ 1160 m., ▲ 3270 м. 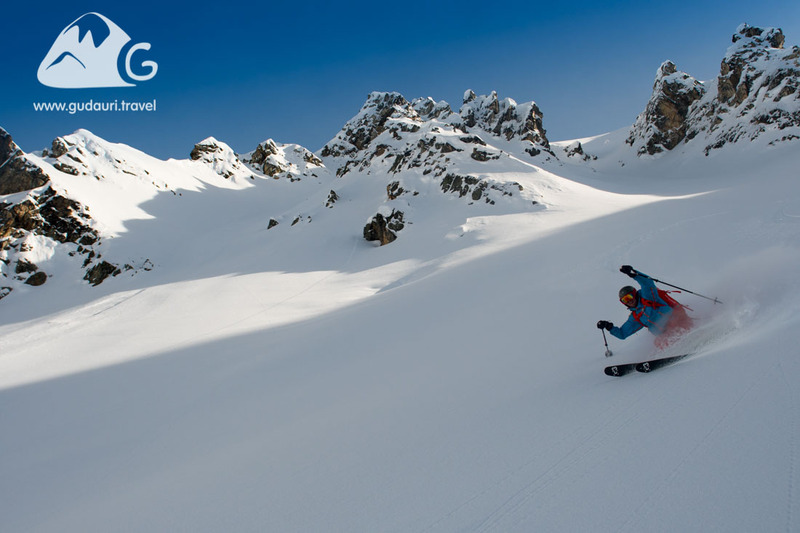 Using the top station of the Sadzele lift, Kobi Gorge is easy to reach from all freeride spots and starting points of descent. and takes no more than 15 minutes on foot or by traverse without ascent. North and northwestern exposures, high altitudes, protection of the gorge by the mountains, and the dry Gudauri climate in general allow snow to remain in a state of dry powder even a month and a half after the last snowfall. Thanks to its easy accessibility, its perfect snow, and the feeling of the Great and Wild Mountains, the routes to Kobi are the most popular with freeriders. The routes to Kobi are the most visited in Gudauri after the routes to the Chrdili Ridge due to their accessibility, endless runs, and the largest vertical height difference at the resort. The routes are, in fact, small journeys within climate zones and are also in one of the most picturesque parts of the Georgian Military Road on the way back to Gudauri. The Kobi Gorge is located on the back of the northern side of the Gudauri Ski Resort. If you go to the top of Mount Sadzele, the highest point of the resort (3270 m.), and go down to the opposite direction of the resort, you will arrive at the Kobi Gorge. The routes differ from beginning to end - from ski out location to the Georgian Military Road. The mid areas of the most popular routes are wide, flat fields (15-20º). Before going down to the Kobi Gorge, make sure to call the Georgian Patrol Police* to ensure that traffic on the Cross Pass and along the Georgian Military Road is open, otherwise you’ll have to return to Gudauri on foot (10 km) or take a 3-hour skitour back to the resort through Kobi pass (altitude 2950 m., GPS coordinates 42.51039, 44.49340). Soon after the start of descent, the mobile network will disappear. * Georgian Patrol Police: +995 322 418 502. In addition to the general avalanche situation in the region, in the Kobi Gorge, the accumulation of critical snow masses as a result of wind and the formation of windslabs make the beginning of the route dangerous. It is highly recommended not to use this route after snowfalls, especially if there are additional southerly winds. Also, some places at the end of the route in the couloirs and in other terrain traps are dangerous. In conditions of poor visibility, it is necessary to avoid the descent through the waterfall along the trajectory of the main channel of the gorge, as you may not notice a sudden 15-meter vertical discharge. If there is good visibility, it circles to the left or right. Standard equipment for freeriding - avalanche transceiver (beeper), probe, shovel., Ski touring / splitboard set., Normal Ski / Solid Snowboard. The lower stations of any lift in Gudauri open at 10:00 (09:00 in April). In order to get to the route faster, it's better to start at the gondola "Good Aura" from New Gudauri, then continue on the lifts "Snow Park" and "Sadzele." Note: *If the ski lift "Sadzele" is not operating (this happens on days of increased avalanche danger, hurricane wind, or insufficient snow cover), then you need to take the “Kudebi” lift to the top of the mountain of the same name (3030 m). You will then descend on a ski piste to the north, to the fields where the skitouring ascent begins. (See the map of ski pistes and lifts http://gudauri.travel/karta-trass- Gudauri.html). The beginning of the ascent is from the point (42.50266, 44.51135). Go to the crosspiece on the left (GPS coordinates of the crosspiece 42.50863, 44.51683), then go around the top of Sadzele from the east. Continue another 20 minutes to the northwest till the descent to the Kobi Gorge (GPS coordinates 42.51720, 44.51989, altitude 3010 m.) This route will take 1-1,5 hours. You can return to the resort by a pre-ordered taxi - call the driver from the middle of the route (here the mobile network appears) - and ask him to meet you near the bridge at Kobi. The standard cost of a 7-seat car to meet you from the Kobi Gorge is 70 lari, and the journey time is 20-25 minutes. If you take this route with a friend (solo runs on this and any other route are unacceptable), you can hitchhike and return to the Gudauri Resort. The choice of a starting point for the route to Kobi depends on whether the lift to the highest point of the resort (Sadzele mountain 2270 m.) is operating or not. If the ski lift "Sadzele" is functional, the route from its top station depends on a selected descent line. It is possible to take the so-called “Kobi-light” route - going left at the lift’s top station, or the “Kobi” route and “Kobi-pro” route – walking 15 minutes from the ski lift along the ridge and then traversing to the right to the crosspiece. The descent to the Georgian Military Road to the car is next to the point 42.54339, 44.49120. Backcountry experience at least two years.